This late-stage fluted preform was found during the excavation of the Thunderbird Clovis site, in northeastern Virginia. The distal (point) end was found during the first season of excavation, at a depth of 3.2 feet below the surface and the base was found the following year at the same depth, nearly three feet away. This Clovis projectile point was broken during the manufacturing process from a failed attempt to thin the hafting area by fluting. One side had already been fluted and the other side was prepared for fluting with a large striking platform. This point was made of local Flint Run jasper and it measures 3 1/16 inches (7.7 cm) long. The Thunderbird site is situated in the Shenandoah Valley in north eastern Virginia. The site was a campsite and stone tool manufacturing site that took advantage of the local source of jasper. 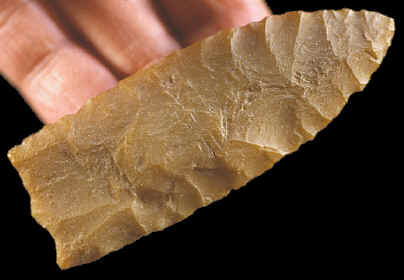 This Clovis site produced a number of late-stage Clovis points that were broken during manufacture. The only complete points found were heavily resharpened and were probably purposely discarded for new replacements.